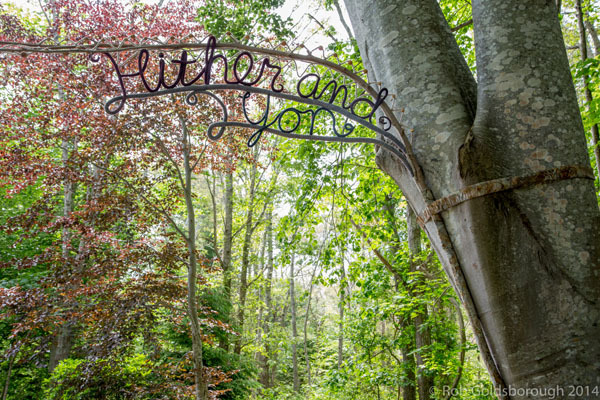 There’s going to be another outdoor art exhibit at Highfield Hall in Falmouth, Massachusetts, Portals and Passageways. I’m excited to be a part of this Cape Cod Art and Environmental Sculpture Exhibit. 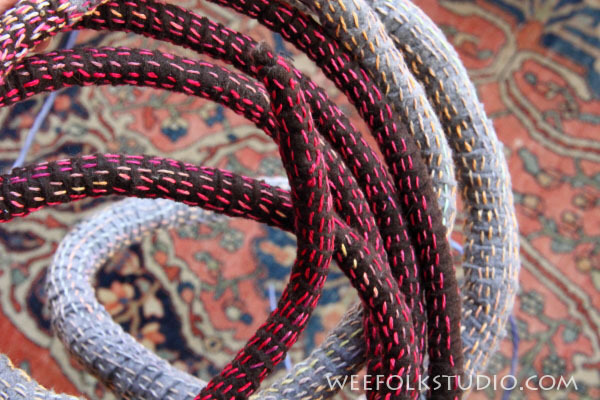 June 29 – Sept. 7, 2014 ~ Portals and Passageways, Highfield Hall, Falmouth, MA. Artist Reception: June 29, 1:00 pm – 3:00 pm. 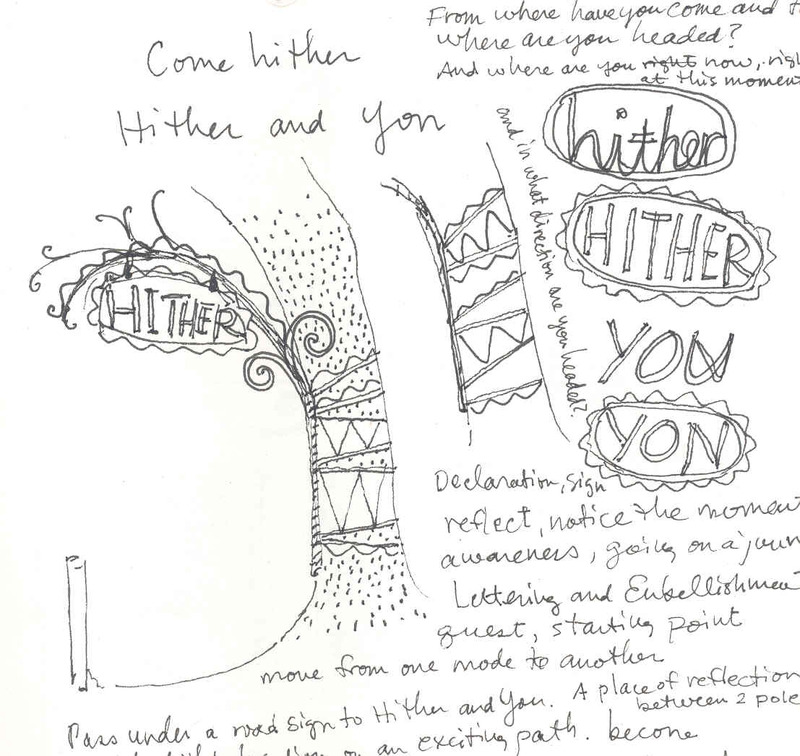 Update: See the Hither and Yon video here. Last summer, I curated the Fairy Houses of Beebe Woods Exhibit at Highfield Hall (to return in 2015), but this year I am happy to be just one of the artists who’s made a portal or passageway for this year’s show. 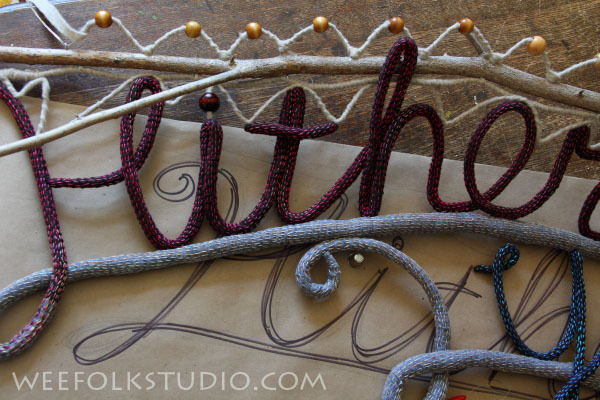 My piece, Hither and Yon uses the same felt covered wire lettering technique that I’ve used in other projects (see here). But this time, the scale is LARGE! Last winter, after being invited to make an installation, I walked around the Highfield property, looking for a spot that called to me. 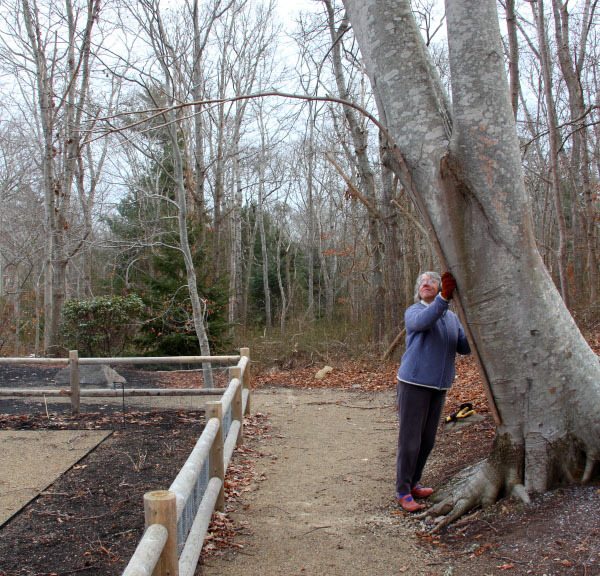 Coming down the path along the west garden, I saw a beech tree leaning toward the path and envisioned a curved branch arching over, creating a space to pass under. I immediately knew that this was where my passageway would be located! I wanted to incorporate words into a kind of sign. I searched the woods around our house and located an 8′ young tree that had grown with a natural bend. I cut it down and brought it over to the Highfield site to see if it would work. Rob took a photo of me holding the branch up against the leaning beech tree and it was the perfect size and shape! I reduced the photo’s contrast and printed out a bunch of copies. 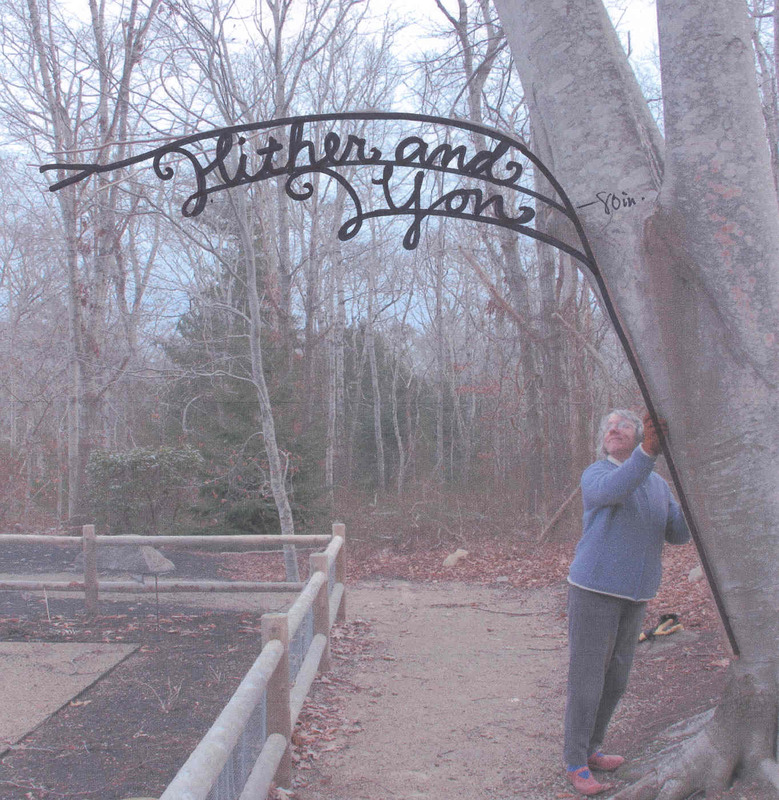 After settling on the words, “Hither and Yon”, I drew on top of the photo, outlining the branch with a marker, trying out several designs. 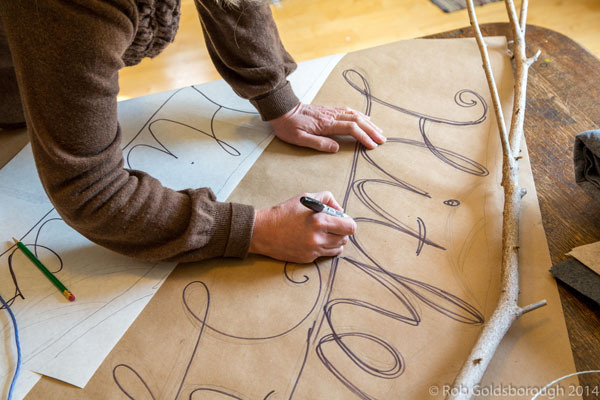 I carried the branch into my studio, lay it on my work table and drew out the letters to scale on a large piece of paper. 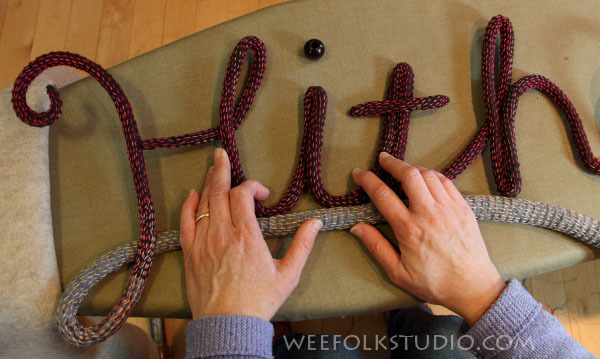 This would be used as a template to form the felt covered wire letters. 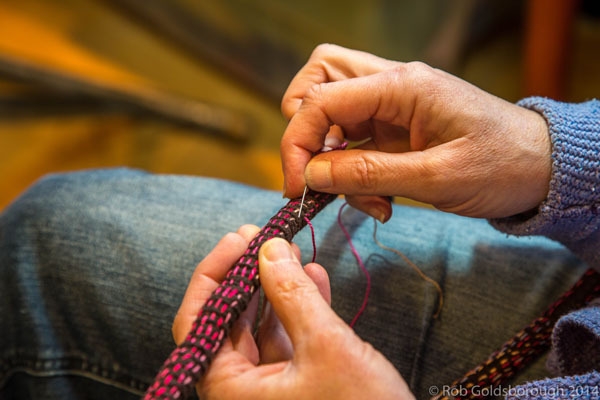 I wound wire with 1/2″ wide (or larger) strips of felt and embroidered it with rows of seed stitches. I used acrylic felt because it’s cheap and I figured that it would hold up through rainy weather. There had to be decorative stitching, of course, even though the sign would be hanging up high, away from close inspection. I bent the wire, writing out the letters and sewing them in place. Being an outdoor sculpture, the sign had to withstand the forces of wind and rain. I attached screw eyes to the wooden branch, which anchored the wire (covered in white) and reinforced the lettering, helping to keep it stable and in position. 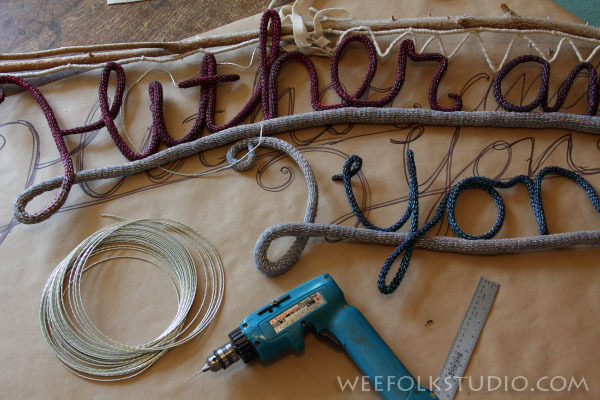 I sewed the letters wherever I could to the grey underline strip and the white covered wire. Yes, it had to be strong, but that doesn’t mean I couldn’t add another stretch of decorative zig-zagged wire and wooden beads along the top. The last challenge was figuring out how to attached the sign to the beech tree without hammering or drilling into the trunk. My engineer husband Rob’s suggestion of using ratchet straps worked beautifully! 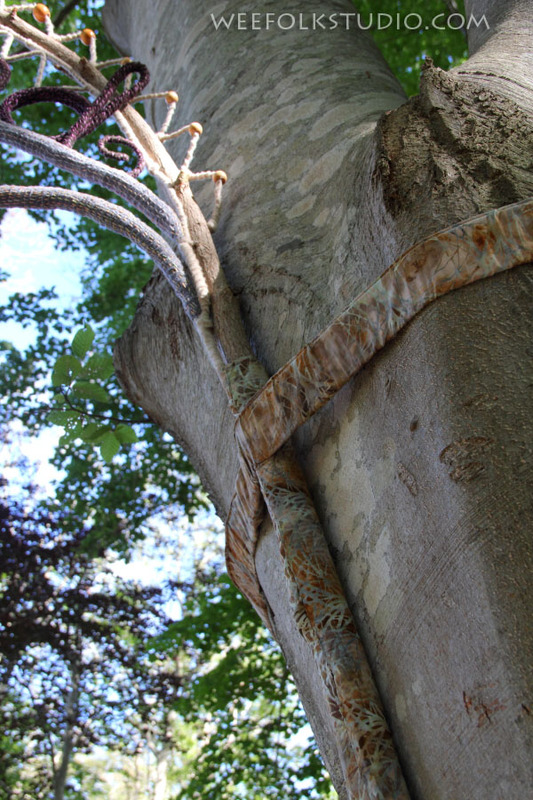 I padded the lower part of the branch with an old yoga mat and covered it with some cotton fabric that was a close match to the tree’s bark. The glaring red ratchet straps were also padded and covered with the camouflage fabric. Hither and Yon is now installed and hardly moves at all in the wind– just the suspended beads at the tip flutter around. Let’s hope that it holds up through the summer. It is so satisfying to have an idea, not knowing exactly how it will come out and working toward making it appear as you envisioned. And it’s come out exactly how I saw it in my mind! I’d like to thank Annie Dean of Highfield Hall for her perseverance and vision in making this show a reality. Portals and Passageways looks to be an exciting event and I hope that many of you can come see it. You can walk around the grounds any time, not just when the museum is open. This entry was posted in Events, Exhibits, Hither and Yon, Nature, Sculpture, Tutorial by Salley Mavor. Bookmark the permalink. 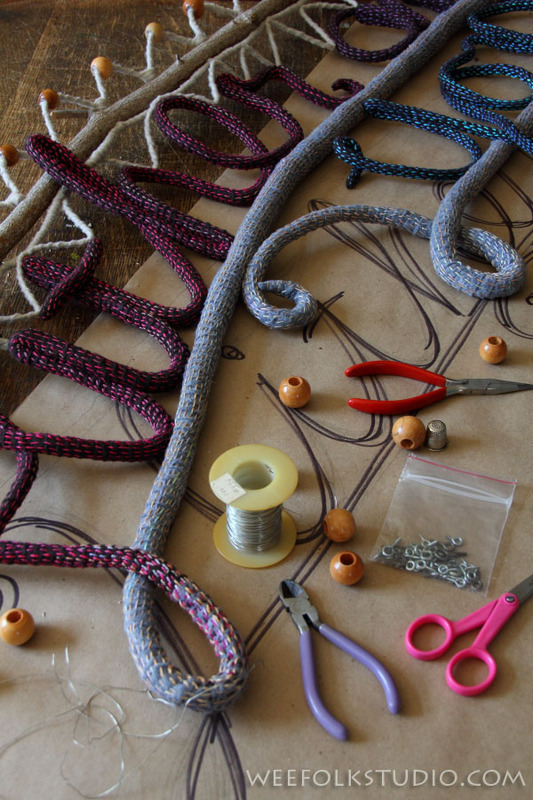 Dear Salley, you must be the patron saint of stitchers, you are an endless source of creativity! Thank you for sharing your gifts! All I can say is – Oh My! This is absolutely charming. It was interesting to see your preparatory notes and sketches, and your process. You are simply amazing! just fabulous. You just get better and better! I have been following your work for years & your imagination just has grown & grown! What a wonderful world you live in! Keep inspiring us with your whimsy! This is wonderful! It looks like it always has been there! Just wonderful!!! I can see this idea spreading to become garden and home signs all over!!!!! I love how you used a batik fabric to cover the yoga mat and the straps. Love the texture that creates.